Opus is a lossy audio coding format developed by the Xiph.Org Foundation and standardized by the Internet Engineering Task Force, designed to efficiently code speech and general audio in a single format, while remaining low-latency enough for real-time interactive communication and low-complexity enough for low-end embedded processors. Opus replaces both Vorbis and Speex for new applications, and several blind listening tests have ranked it higher-quality than any other standard audio format at any given bitrate until transparency is reached, including MP3, AAC, and HE-AAC. Opus combines the speech-oriented linear predictive coding SILK algorithm and the lower-latency, MDCT-based CELT algorithm, switching between or combining them as needed for maximal efficiency. Bitrate, audio bandwidth, complexity, and algorithm can all be adjusted seamlessly in each frame. Opus has the low algorithmic delay (26.5 ms by default) necessary for use as part of a real-time communication link, permitting natural conversation, networked music performances, and live lip sync; by trading-off quality or bitrate, the delay can be reduced down to 5 ms. Its delay is exceptionally low compared to competing codecs, which require well over 100 ms, yet Opus performs very competitively with these formats in terms of quality per bitrate. As an open format standardized through RFC 6716, a reference implementation called libopus is available under the New BSD License. The reference has both fixed-point and floating-point optimizations for low- and high-end devices, with SIMD optimizations on platforms that support them. All known software patents that cover Opus are licensed under royalty-free terms. Opus supports constant and variable bitrate encoding from 6 kbit/s to 510 kbit/s, frame sizes from 2.5 ms to 60 ms, and five sampling rates from 8 kHz (with 4 kHz bandwidth) to 48 kHz (with 20 kHz bandwidth, the human hearing range). An Opus stream can support up to 255 audio channels, and it allows channel coupling between channels in groups of two using mid-side coding. Opus has very short latency (26.5 ms using the default 20 ms frames and default application setting), which makes it suitable for real-time applications such as telephony, Voice over IP and videoconferencing; research by Xiph led to the CELT codec, which allows the highest quality while maintaining low delay. In any Opus stream, the bitrate, bandwidth, and delay can be continually varied without introducing any distortion or discontinuity; even mixing packets from different streams will cause a smooth change, rather than the distortion common in other codecs. Unlike Vorbis, Opus does not require large codebooks for each individual file, making it more efficient for short clips of audio and more resilient. As an open standard, the algorithms are openly documented, and a reference implementation (including the source code) is published. Broadcom and the Xiph.Org Foundation own software patents on some of the CELT algorithms, and Skype Technologies/Microsoft own some on the SILK algorithms; each offers a royalty-free perpetual for use with Opus, reserving only the right to make use of their patents to defend against infringement suits of third parties. Qualcomm, Huawei, France Telecom, and Ericsson have claimed that their patents may apply, which Xiph's legal counsel denies, and none have pursued any legal action. The Opus license automatically and retroactively terminates for any entity that attempts to file a patent suit. Spectrogram of Opus-encoded audio as bitrate rises (~32 to ~160 kbit/s) clearly shows lowpass behavior and better preservation of the band energy with CELT (compare original, Vorbis, MP3, AAC). The Opus format is based on a combination of the full-bandwidth CELT format and the speech-oriented SILK format, both heavily modified: CELT is based on the MDCT that most music codecs use, using CELP techniques in the frequency domain for better prediction, while SILK uses linear predictive coding (LPC) and an optional Long-Term Prediction filter to model speech. In Opus, both were modified to support more frame sizes, as well as further algorithmic improvements and integration, such as using CELT's range encoder for both types. To minimize overhead at low bitrates, if latency is not as pressing, SILK has support for packing multiple 20 ms frames together, sharing context and headers; SILK also allows Low Bit-Rate Redundancy (LBRR) frames, allowing low-quality packet loss recovery. CELT includes both spectral replication and noise generation, similar to AAC's SBR and PNS, and can further save bits by filtering out all harmonics of tonal sounds entirely, then replicating them in the decoder. Better tone detection is an ongoing project to improve quality. The reference implementation is written in C and compiles on hardware architectures with or without a floating-point unit, although floating-point is currently required for audio bandwidth detection (dynamic switching between SILK, CELT, and hybrid encoding) and most speed optimizations. Alternatively, each Opus packet may be wrapped in a network packet which supplies the packet length. Opus packets may be sent over an ordered datagram protocol such as RTP. Opus was proposed for the standardization of a new audio format at the IETF, which was eventually accepted and granted by the codec working group. It is based on two initially separate standard proposals from the Xiph.Org Foundation and Skype Technologies S.A. (now Microsoft). Its main developers are Jean-Marc Valin (Xiph.Org, Octasic, Mozilla Corporation), Koen Vos (Skype), and Timothy B. Terriberry (Xiph.Org, Mozilla Corporation). Among others, Juin-Hwey (Raymond) Chen (Broadcom), Gregory Maxwell (Xiph.Org, Wikimedia), and Christopher Montgomery (Xiph.Org) were also involved. In March 2009, Skype suggested the development and standardization of a wideband audio format within the IETF. Nearly a year passed with much debate on the formation of an appropriate working group. Representatives of several companies which were taking part in the standardization of patent-encumbered competing formats stated objections against the start of the standardization process for a royalty-free format: representatives of Polycom and Ericsson—the creators and licensors of G.719—as well as France Télécom, Huawei and the Orange Labs (department of France Télécom), which were involved in the creation of G.718. The working group finally formed in February 2010, and even the corresponding Study Group 16 from the ITU-T pledged to support its work. In July 2010, a prototype of a hybrid format was presented that combined the two proposed format candidates SILK and CELT. In September 2010, Opus was submitted to the IETF as proposal for standardization. For a short time the format went under the name of Harmony before it got its present name in October 2010. At the beginning of February 2011, the bitstream format was tentatively frozen, subject to last changes. Near the end of July 2011, Jean-Marc Valin was hired by the Mozilla Corporation to continue working on Opus. In November 2011, the working group issued the last call for changes on the bitstream format. The bitstream has been frozen since January 8, 2012. On July 2, 2012, Opus was approved by the IETF for standardization. The reference software entered release candidate state on August 8. The final specification was released as RFC 6716 on September 10, 2012. and versions 1.0 and 1.0.1 of the reference implementation libopus were released the day after. On July 11, 2013, libopus 1.0.3 brought bug fixes and a new Surround sound API that improves channel allocation and quality, especially for LFE. On December 5, 2013, libopus 1.1 was released, incorporating overall speed improvements and significant encoder quality improvements: Tonality estimation boosts bitrate and quality for previously problematic samples, like harpsichords; automated speech/music detection improves quality in mixed audio; mid-side stereo reduces the bitrate needs of many songs; band precision boosting for improved transients; and DC rejection below 3 Hz. Two new VBR modes were added: unconstrained for more consistent quality, and temporal VBR that boosts louder frames and generally improves quality. Opus has been shown to have excellent quality, and at higher bit rates, it turns out to be competitive with audio formats with much higher delay, such as HE-AAC and Vorbis. In listening tests around 64 kbit/s, Opus shows superior quality compared to HE-AAC codecs, which were previously dominant due to their use of the patented spectral band replication (SBR) technology. In listening tests around 96 kbit/s, Opus shows slightly superior quality compared to AAC and significantly better quality compared to Vorbis and MP3. Opus has very low algorithmic delay, a necessity for use as part of a low-audio-latency communication link, which can permit natural conversation, networked music performances, or lip sync at live events. Total algorithmic delay for an audio format is the sum of delays that must be incurred in the encoder and the decoder of a live audio stream regardless of processing speed and transmission speed, such as buffering audio samples into blocks or frames, allowing for window overlap and possibly allowing for noise-shaping look-ahead in a decoder and any other forms of look-ahead, or for an MP3 encoder, the use of bit reservoir. Total one-way latency below 150 ms is the preferred target of most VoIP systems, to enable natural conversation with turn-taking little affected by delay. Musicians typically feel in-time with up to around 30 ms audio latency, roughly in accord with the fusion time of the Haas effect, though matching playback delay of each user's own instrument to the round-trip latency can also help. It is suggested for lip sync that around 45–100 ms audio latency may be acceptable. Opus permits trading-off reduced quality or increased bitrate to achieve an even smaller algorithmic delay (5.0 ms minimum). While the reference implementation's default Opus frame is 20.0 ms long, the SILK layer requires a further 5.0 ms lookahead plus 1.5 ms for resampling, giving a default delay of 26.5 ms. When the CELT layer is active, it requires 2.5 ms lookahead for window overlap to which a matching delay of 4.0 ms is added by default to synchronize with the SILK layer. If the encoder is instantiated in the special restricted low delay mode, the 4.0 ms matching delay is removed and the SILK layer is disabled, permitting the minimal algorithmic delay of 5.0 ms. The format and algorithms are openly documented and the reference implementation is published as free software. Xiph's reference implementation is called libopus and a package called opus-tools provides command-line encoder and decoder utilities. It is published under the terms of a BSD-like license. It is written in C and can be compiled for hardware architectures with or without a floating-point unit. The accompanying diagnostic tool opusinfo reports detailed technical information about Opus files, including information on the standard compliance of the bitstream format. It is based on ogginfo from the vorbis-tools and therefore — unlike the encoder and decoder — is available under the terms of version 2 of the GPL. Digital Radio Mondiale – a digital radio format for AM frequencies – can broadcast and receive Opus audio (albeit not recognised in official standard) using Dream software-defined radio. Most end-user software relies on multimedia frameworks provided by the operating system. Native Opus codec support is implemented in most major multimedia frameworks for Unix-like operating systems, including GStreamer, FFmpeg, and Libav libraries. Google added native support for Opus audio playback in Android 5.0 ("Lollipop"). The support was limited, however, to Opus audio encapsulated in Matroska containers, such as .mkv and .webm files. Android 6.0 ("Marshmallow") and Android 7.0 ("Nougat") added support for Opus audio encapsulated in Ogg containers. Due to the addition of WebRTC support in Apple's WebKit rendering engine, macOS High Sierra and iOS 11 come with native playback support for Opus audio encapsulated in Core Audio Format containers. On Windows 10, Microsoft provides native support for Opus audio encapsulated in Matroska and WebM files for Windows 10 Anniversary Update (1607) devices. Support for Opus audio encapsulated in Ogg containers is available with Web Media Extensions, a pre-installed add-on for Windows 10 Fall Creators Update (1709) devices. On Windows 8.1 and older, third-party decoders, such as LAV Filters, are available to provide limited support. - On Anniversary Update (1607), limited support is available in Microsoft Edge (via MSE only) and Universal Windows Platform apps. Windows Media Player does not support Ogg; only WebM and Matroska. - On April 2018 Update (1803) with Web Media Extensions preinstalled, Microsoft Edge (EdgeHTML 17) supports Opus audio embedded in <audio> tags. - Requires installation of a third-party multimedia framework, LAV Filters. While support in multimedia frameworks automatically enables Opus support in software which is built on top of such frameworks, several applications developers made additional efforts for supporting the Opus audio format in their software. Such support was added to AIMP, Amarok, cmus, Music Player Daemon, foobar2000, Mpxplay, MusicBee, SMplayer, VLC media player, Winamp and Xmplay audio players; Icecast, Airtime (software) audio streaming software; and Asunder audio CD ripper, CDBurnerXP CD burner, FFmpeg, Libav and MediaCoder media encoding tools. Streaming Icecast radio trials are live since September 2012 and January 2013. SteamOS uses Opus or Vorbis for streaming audio. Opus support is mandatory for WebRTC implementations. Opus is supported in Mozilla Firefox, Chromium and Google Chrome, Blink-based Opera, as well as all browsers for Unix-like systems relying on GStreamer for multimedia formats support. Although Internet Explorer will not provide Opus playback natively, support for the format is built into the Edge browser, along with VP9, for full WebM support. Safari supports Opus as of iOS 11 and macOS High Sierra. Due to its abilities, Opus gained early interest from VoIP software vendors. Several SIP clients, including Acrobits Softphone, Bria X-Lite, CSipSimple (via additional plug-in), Empathy (via GStreamer), Jitsi, Tuenti, Line2 (currently only on iOS), Linphone, Phoner and PhonerLite, SFLphone, Mumble, Discord and TeamSpeak 3 voice chat software also support Opus. TrueConf supports Opus in its VoIP products. Asterisk lacked builtin Opus support for legal reasons, but a third-party patch was available for download and official support via a binary blob was added in September 2016. Tox P2P videoconferencing software uses Opus exclusively. Classified-ads distributed messaging app sends raw opus frames inside TLS socket in its VoIP implementation. The PlayStation 4 video game console also uses the CELT/Opus codec for its system party chat. Since version 3.13, Rockbox enables Opus playback on supported portable media players, including some products from the iPod series by Apple, devices made by iriver, Archos and Sandisk, and on Android devices using "Rockbox as an Application". All recent Grandstream IP phones support Opus audio both for encoding and decoding. OBihai OBi1062, OBi1032 and OBi1022 IP phones all support Opus. Recent BlueSound wireless speakers support Opus playback. Devices running Hiby OS, like the Hiby R3, are capable of decoding Opus files natively. ^ Opus cuts audio above 20 kHz, the generally accepted upper limit of the human hearing range. ^ a b On Android and Microsoft Windows, the .opus filename extension isn't recognized by Android's MediaScanner service and Universal Windows Platform apps. A pseudo extension of another audio format (such as .ogg or .m4a) is required to detect and playback files. ^ a b Terriberry, Timothy; Lee, Ron; Giles, Ralph (April 2016). "Content Type". Ogg Encapsulation for the Opus Audio Codec. IETF. p. 30. sec. 9. doi:10.17487/RFC7845. RFC 7845. Retrieved 2016-04-30. ^ Spittka, Julian; Vos, Koen; Valin, Jean-Marc (2015-06-30). "Opus Media Type Registration". RTP Payload Format for the Opus Speech and Audio Codec. IETF. p. 9. sec. 6.1. doi:10.17487/RFC7587. ISSN 2070-1721. RFC 7587. Retrieved 2015-06-30. ^ a b c "Opus Codec". Opus (Home page). Xiph.org Foundation. Retrieved July 31, 2012. ^ Bright, Peter (2012-09-12). "Newly standardized Opus audio codec fills every role from online chat to music". Ars Technica. Retrieved 2014-05-28. ^ a b Valin, Jean-Marc; Vos, Koen; Skoglund, Jan (2013-05-17). Hoene, Christian, ed. "Summary of Opus listening test results". Internet Engineering Task Force. Retrieved 2015-06-30. ^ a b Kamedo2 (July 2014). "Results of the public multiformat listening test". ^ a b Jean-Marc Valin; Gregory Maxwell; Timothy B. Terriberry; Koen Vos (October 17–20, 2013). "High-Quality, Low-Delay Music Coding in the Opus Codec" (PDF). www.xiph.org. New York, USA: Xiph.Org Foundation. p. 2. Retrieved 19 August 2014. CELT's look-ahead is 2.5 ms, while SILK's look-ahead is 5 ms, plus 1.5 ms for the resampling (including both encoder and decoder resampling). For this reason, the CELT path in the encoder adds a 4 ms delay. However, an application can restrict the encoder to CELT and omit that delay. This reduces the total look-ahead to 2.5 ms.
^ a b Chen, Raymond (April 1, 2011). "Opus Testing" (PDF). Retrieved 2016-01-02. ^ a b "Opus Codec License". Xiph.org. Retrieved 2015-12-22. ^ "Nokia's VP8 patent claims: we've been here before". OSNews. 2013-05-25. Retrieved 2014-07-17. ^ Montgomery, Christopher (December 23, 2010). "next generation audio: CELT update 20101223". ^ Bunkus, Moritz (2013-09-16). "MKVToolNix v6.4.0 released". Matroska users (Mailing list). Retrieved 2013-12-24. ^ "WebM Container Guidelines". The WebM Project. Retrieved 19 October 2015. ^ "List of Registered MPEG TS Identifiers – SMPTE Registration Authority, LLC". SMPTE. 2019-01-05. Retrieved 2019-01-05. ^ "Encapsulation of Opus in ISO Base Media File Format". 2018-08-28. Retrieved 2019-01-05. ^ Spittka, Julian; Vos, Koen; Valin, Jean-Marc (2015-06-30). RTP Payload Format for the Opus Speech and Audio Codec. IETF. doi:10.17487/RFC7587. ISSN 2070-1721. RFC 7587. Retrieved 2019-01-05. ^ Valin, Jean-Marc; Vos, Koen; Terriberry, Timothy B. (2012-09-11). "Self-Delimiting Framing". Definition of the Opus Audio Codec. IETF. p. 321. sec. appendix-B. doi:10.17487/RFC6716. ISSN 2070-1721. RFC 6716. Retrieved 2019-01-05. ^ Valin, Jean-Marc; Vos, Koen; Terriberry, Timothy B. (2012-09-11). 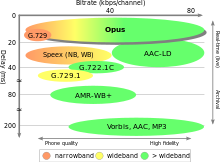 "Opus Codec Overview". Definition of the Opus Audio Codec. p. 8. sec. 2. doi:10.17487/RFC6716. ISSN 2070-1721. RFC 6716. Retrieved 2014-06-21. ^ "IETF working towards royalty-free audio codec". H-online.com. 2009-11-13. Retrieved 2016-04-07. ^ Vos, Koen (2010-10-15). "Harmony became Opus". codec (Mailing list). IETF. Retrieved 2016-01-03. ^ "IETF Opus codec now ready for testing". Hydrogenaudio. Retrieved 2012-09-12. ^ Valin, Jean-Marc (2011-08-01). "IETF update, Mozilla". LiveJournal.com. Retrieved 2012-10-05. ^ "Opus Codec". Xiph.org Foundation. Retrieved 2012-09-12. ^ "Opus approved by the IETF". Jmspeex.livejournal.com. 2012-07-03. Retrieved 2012-09-12. ^ "[opus] Release candidates for 1.0.0 and 1.0.1 are available". opus (Mailing list). Xiph.org Foundation. Retrieved 2012-10-05. ^ "It's Opus, it rocks and now it's an audio codec standard!". Mozilla Hacks. Retrieved 2012-09-12. ^ "RFC 6716 on Definition of the Opus Audio Codec". announce (Mailing list). IETF. Retrieved 2012-09-12. ^ a b Monty; Valin, Jean-Marc. "Opus update 20131205: 1.1 Release". ^ "libopus 1.2 – Opus Codec". Opus-codec.org. 2017-06-20. Retrieved 2017-08-23. ^ Zimmerman, Steven (2017-07-07). "Opus 1.2 Codec Arrives on Your Phone: High Quality Audio at 32 kbps". XDA Developers. Archived from the original on 2017-07-13. Retrieved 2017-07-12. ^ Valin, Jean-Marc (2017-06-20). "Opus 1.2 released". ^ "Opus Codec". www.opus-codec.org. Retrieved 2018-10-22. ^ "Opus 1.3 Released". people.xiph.org. Retrieved 2018-10-22. ^ Maxwell, Gregory (2011). "64kbit/sec stereo multiformat listening test — unofficial results page". Xiph.Org Foundation. Retrieved 2011-06-19. ^ Lutzky, Manfred; Schuller, Gerald; Gayer, Marc; Krämer, Ulrich; Wabnik, Stefan (2004). "A guideline to audio codec delay" (PDF). In AES 116th Convention, Berlin, Germany: 8–11. Retrieved 21 December 2016. ^ Lironi, F.; Masseroni, C.; Trivisonno, R.; Ball, C. F. (2005). "Multi RAB-based multimedia services over GERAN mobile networks". Vehicular Technology Conference, VTC-2005-Fall. IEEE 62nd. 3: 1662–1666. Retrieved 30 October 2012. ^ Carôt, Alexander (2010). "Low Latency Audio Streaming for Internet-Based Musical Interaction" in Streaming Media Architectures: Techniques and Applications: Recent Advances. IGI Global. pp. 362–383. ISBN 978-1-61692-833-9. ^ Montgomery, Christopher. "A quick showcase of the bleeding edge... CELT 0.10.0 @ constant PEAQ value, varying latency". CELT v0.10 (latest prior to Opus integration). xiph.org. Retrieved 30 October 2012. ^ Pehlivanov, Rostislav (11 February 2017). "opus: add a native Opus encoder". Git.videolan.org. Retrieved 2017-08-23. ^ "Git – GStreamer/gst-plugins-base". Retrieved 26 October 2017. ^ "lostromb/concentus: Pure Portable C# and Java implementations of the Opus audio codec". GitHub. Retrieved 2017-08-23. ^ "Tieline Integrates OPUS into Report-IT and IP codecs". Radio Magazine. 2012-12-18. Archived from the original on 2013-05-09. Retrieved 2012-12-18. ^ "GStreamer: news". Gstreamer.freedesktop.org. Retrieved 2012-10-05. ^ "Audio Codecs". FFmpeg General Documentation. Retrieved 2014-05-28. ^ "Audio Codecs". Libav General Documentation. Retrieved 2014-05-28. ^ Google. "Android Lollipop". Retrieved 2015-11-03. ^ "Supported Media Formats". Retrieved 2015-04-29. ^ Google. "Issue 80729: Opus support not working". Retrieved 2016-04-19. ^ a b c "Android 7.0 (N) Compatibility Definition". Retrieved 2017-05-22. ^ "lavfilters — Open-Source DirectShow Media Splitter and Decoders". Google Project Hosting. Archived from the original on 2013-01-03. Retrieved 2012-10-05. ^ "AIMP: Home Page". Aimp.ru. Retrieved 2012-10-05. ^ "Amarok 2.8 "Return To The Origin" released". Amarok. 2013-08-16. Retrieved 2014-05-28. ^ "foobar2000 v1.1.14 beta". Hydrogenaudio Forums. Retrieved 2012-10-05. ^ "VLC 2.0.4 Twoflower". VideoLAN. Retrieved 2012-10-19. ^ "Icecast 2.4 beta release". Lists.xiph.org. Retrieved 2012-09-12. ^ Airtime, Changelog. "Airtime/changelog at 2.4.x". Sourcefabric. Retrieved 1 July 2013. ^ Radio Jackie, Listen Now. "Opus Stream". Radio Jackie. Retrieved 14 May 2013. ^ Absolute Radio, Listen Labs. "Opus Streaming Trial". Absolute Radio. Retrieved 30 October 2012. ^ "Steam Beta Update: SteamVR and In-Home Streaming Beta". SteamDB. Retrieved 9 December 2015. ^ "Zwei Audio-Codecs für Echtzeit-Kommunikation im Browser". Heise.de. Retrieved 2012-09-12. ^ "Media formats supported by the HTML audio and video elements". Developer.mozilla.org. 2012-09-03. Archived from the original on 2010-06-27. Retrieved 2012-09-12. ^ "Issue 104241: Support OPUS in Ogg files for the audio tag and Audio object". Chromium bug tracker. Retrieved 2014-05-28. ^ "Why no official mention of Opus support?". My.opera.com. 2012-07-19. Retrieved 2012-09-12. ^ Shankland, Stephen (2012-08-17). "How corporate bickering hobbled better Web audio". CNET News. Retrieved 2012-09-12. ^ "Platform status". Microsoft. 2016-04-19. ^ "WebM, VP9 and Opus Support in Microsoft Edge". Microsoft. 2016-04-18. ^ Bocquet, Ludovic (2013-03-07). "Jitsi 2.0 Now Released!". XMPP Foundation. Archived from the original on 2014-05-29. Retrieved 2014-05-28. ^ "Tuenti+WebRTC (Voip2day 2014)". 2014-10-21. ^ "A new Line2 for iOS experience with improved sound quality". Line2. 2012-10-18. Archived from the original on 2013-03-15. Retrieved 2013-03-15. ^ "SFLphone — Task #14602: [Codec] Implement opus". Savoir-faire Linux. 2012-08-13. Archived from the original on 2012-12-17. Retrieved 2012-09-12. ^ "What Features Does Discord Have?". Discord. Retrieved 2017-10-29. ^ Brandon (2013-06-19). "Mumble 1.2.4 Has been released". Mumblevoice Blog. Archived from the original on 2014-06-28. Retrieved 2014-05-28. ^ "TeamSpeak 3 Client 3.0.10 released". TeamSpeak Forums. Retrieved 2013-03-04. ^ "TeamSpeak 3 Server Version 3.0.7 released". TeamSpeak Forums. Retrieved 2013-03-04. ^ "TrueConf сделал ставку на аудиокодек Opus" [TrueConf opted for Opus audio codec] (Press release) (in Russian). Moscow, Russia. 2012-09-19. Archived from the original on 2014-05-29. Retrieved 2014-05-28. ^ Jordan, Matthew (2013-05-29). "Opus and VP8". asterisk-dev (Mailing list). Retrieved 2014-05-28. ^ "Asterisk Opus/VP8 patch". GitHub. Retrieved 2014-05-28. ^ "Opus for Asterisk". Inside the Asterisk. 2016-09-30. Retrieved 2016-10-03. ^ "Tox codec handling source code". GitHub. Retrieved 2015-12-09. ^ "Classified-ads audio encoder documentation". Retrieved 2016-05-25. ^ "Open Source Software used in PlayStation®4". Sony Interactive Entertainment Inc. Retrieved 2017-12-11. ^ Rockbox Contributors (2013-03-05). "Release notes for Rockbox v.3.13". Rockbox. Retrieved 2013-03-21. ^ "RockboxAsAnApplication2010 < Main < Wiki". Rockbox.org. Retrieved 2012-10-05. ^ "PULSE FLEX". BlueSound. Retrieved 28 February 2017.